Although Greek seaman had embarked upon explorations of Canada on vessels owned by other European countries, Greeks did not begin settling in Canada until the early nineteenth century. The major reason for this was the Greek revolution (1821-1836). Most of these emigrants originated from the Aegean islands and the Peloponnesus, most specifically the villages of Arcadia and Laconia. The primary area of settlement in Canada for these early migrants was Montreal. 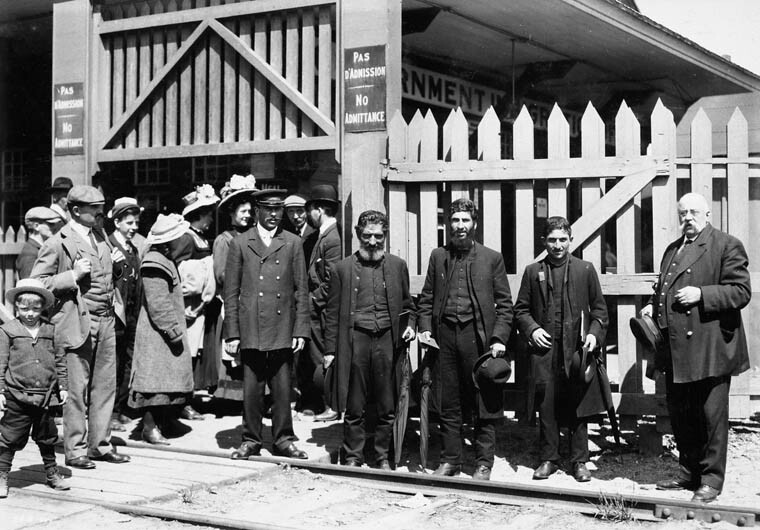 Greek immigration to Canada continued to be slow throughout the nineteenth century but increased dramatically in the early twentieth century. This was in large part due to poverty and political instability in Greece. Nevertheless, Canada's preference for immigrants from Northern and Western Europe impeded large-scale immigration from Greece. The 1911 census recorded 3650 Greeks in Canada, most of them living in Montreal and Quebec (Quebec), Toronto (Ontario), Halifax (Nova Scotia), Edmonton (Alberta) and Winnipeg (Manitoba). Most were businessmen, running their own stores, hotels, bakeries and restaurants. A steady flow of immigrants entered Canada after this time but emigration stopped during the Second World War. After this period, Canada became more open to immigrants from southern Europe and through family sponsorship and other employment schemes Greeks had easier entrance into Canada. After the end of the War, immigration sharply picked up and over 100 000 Greeks entered Canada between 1945 and 1971. Over eighty percent of Greek Canadians live in the provinces of Quebec and Ontario, with heavy concentrations in the cities of Montreal and Toronto. However, Greek populations can be found in many of Canada's major cities. Immigration from Greece reached its peak in 1967 and gradually declined in the following decades. There was also steady immigration of Greeks from Cyprus to Canada beginning after the Second World War. There was a peak in emigration from Cyprus after an uprising of the Turkish Cypriot community in Cyprus, which resulted in the bombings of towns and villages in southeastern Cyprus. The largest wave of Cypriot immigrants however occurred after the Turkish invasion of Cyprus in 1974 when over 200,000 Greek Cypriots fled Cyprus and settled in Greece. Many of these English-speaking refugees continued to Canada and settled in Montreal (Quebec), Toronto, Hamilton, and Kitchener (Ontario). There are over 25,000 Greek Cypriots in Canada today, and approximately 250,000 people of Greek descent, originating from various countries. Immigration from Greece, 1917 to 1948, RG 76, volume 645, file 998358, microfilm C-10585. This file contains general correspondence relating to Greek immigration to Canada. Only rarely are individual immigrants mentioned. Greek Embassy, Ottawa, Ontario. Admission of 200 Greeks from China, RG 76, volume 675, file D46144, microfilm C-10677. This file includes lists of names. Library and Archives Canada also holds other private records regarding Greek families. Consult the Archives Search database using keywords such as a surname or the name of an organization. A Chronicle of the Hellenic Community of Vancouver, published by The Community. Gone but not Forgotten: A Definitive History of the Greek Section at Woodlawn Cemetery, by Nicholas M. Prevas. Greek Canadians in Kingston, by Mary Mayson.